Twenty-four students, age 13-24, were recognized, including 13 young scientists from the United States, three from Canada and one each from Australia, Brazil, Kosovo, Nigeria, Thailand, Turkey and Uruguay. The Mars Generation (TMG) is a volunteer-driven nonprofit with an advisory board that includes astronauts, engineers, scientists and professionals. The organization has served more than 10,200 students and adults from around the world through programs such as its Student Space Ambassador Program, Future of Space Outreach Program and Space Camp Scholarship. The organization aims to excite and educate students and adults about the importance of human space exploration and STEAM education to the future of humankind. 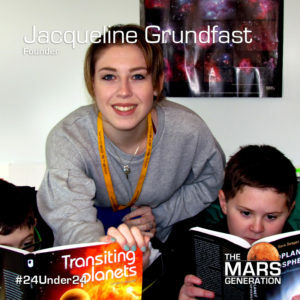 Jacqueline is taking her love of space and works hard to inspire her community to do the same. She established the Warwick Valley Central School District Astronomy Club, and she can be found judging STEAM Fairs in her district as well as teaching and mentoring young students in their research and science studies. This work inspired her to secure funding from her school district to build a robotic telescope for her community, promoting night sky exploration. In addition to doing a tremendous amount of outreach for her community, Grundfast still somehow finds time to be a high school student and a member of numerous national scholar societies. We’ll be hearing more about Grundfast!